2011 has been Heimana’s year. He won important local events and he was able to travel and compete in Arizona (Phoenix AM), California (Vans AM Tec Combi, Tim Brauch Memorial), and Oregon (Oregon Tri-Fecta) to gain respect and exposure in an international field. Heimana worked extremely hard and finished by earning the #1 spot of the World Cup Skateboarding title for 15-under AM level bowl skaters. Heimana is continuing to progress in skateboarding and is becoming known as an “all around” skater (park, bowl, street). During the 2011 year, Heimana was exposed to the AM world and is quickly gaining recognition for his skateboarding ability as well as his great character. Heimana has gained national/local exposure (2010 Disney XD, “Next X” champion) being featured on television, newspapers, magazines, and radio over the last few years to name a few. 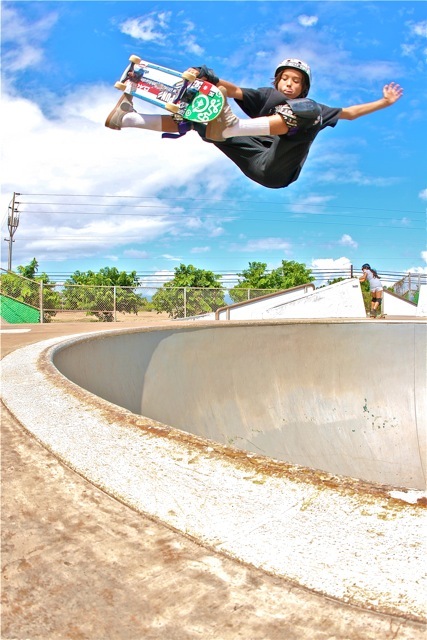 In Hawaii, where he was born, Heimana is a recognizable figure at any skate scene and has the respect of his peers. Heimana is now looking forward to the 2012 season and is anticipating competing in more events and is hopeful to travel more throughout the year.